It is only a small room, with no windows, off a dead-end corridor in our local hospital. You could easily walk past it and not realise it’s there. But inside that room is a team of people that are transforming Shropshire’s health and social care services. I am describing the Frailty Intervention Team (FIT), a multi-disciplinary team in Shrewsbury and Telford Hospital NHS Trust (SaTH). Based on evidence-based models in Luton and Dunstable, Coventry and Aintree, and supported by the Acute Frailty Network (AFN), Shropshire’s version has a community matron and a social worker sat alongside doctors, advanced nurse practitioners (ANPs), physiotherapists and occupational therapists. Their aim is to identify patients over the age of 75 who come into A&E who could potentially be discharged within 72 hours. The cupboard-like room provides a space to quickly ‘huddle’ and discuss these patients and their progress. The rest of the time these team members are out on the ‘shop floor’ in A&E and assessment areas, identifying patients, joining forces to give holistic health and social care and getting them home in a care setting that previously might have had a lower threshold for admitting these patients onto the wards. Why is it important to get patients back to what they call home? Firstly, we know this is better for the patient. Once a patient hits their 80s, even a short spell in hospital can result in significant deconditioning – muscle loss – which can have a significant impact on their chances of recovery and getting home. Frailty is a condition that creeps up on people. It’s what SaTH’s geriatrician Dr Suzy Thompson, likes to call, “lack of bouncebackability”. As we get older our ability to recover from seemingly minor events like a urinary tract infection or a fall decreases; they hit us harder and we need more time to get back to normal. Secondly, it’s a better approach for our over-stretched health and social care system. Like many areas of the country, Shropshire has a significant older population with those over 85 expected to increase by nearly 40 per cent by 2025. Though their numbers in A&E are relatively small compared with other age groups, their impact on the health and social care system is disproportionately higher because their needs are more complex. While an admission can be the right decision, there are risks attached to being on a ward – complications from lack of mobilisation and hospital-acquired infections, not to mention the psychological and emotional impact of being removed from family and friends. We also know an admission can sometimes happen for reasons other than a medical need – delayed transfers of care or a lack of time to understand a patient’s baseline health prior to their admission. A conversation around the appropriateness of doing a whole raft of tests that their GP might have already done can completely change the way a patient is managed. FIT’s presence in A&E has had a big impact on the way these patients are now managed. All patients over 75 now have a frailty assessment based on the Rockwood Score when they are seen in A&E. If they meet a set of criteria, the FIT is then bleeped and the therapy and social care arms of the team set to work. ANPs work closely with doctors to identify potential patients and get those clinical conversations started. The community matrons often know these patients or add them to their list, supporting their discharge and working with the patient and their carers to understand the reasons behind an admission and potential community support to avoid future ones. The team has sustained a 10% reduction in admissions to the ward in the over 75s, with a third of patients on the FIT caseload going home on the same day they arrived in A&E. Our social care colleagues are also seeing a decrease in dependency on nursing and residential care for these patients. There is a long way to go but the potential is huge. Key to the FIT’s success has been the engagement and commitment shown by the team and impressive leadership skills shown not just by its clinicians but by its lead therapists and programme manager. Ironically, this hospital-based team is the start of a wholesale change in how the community delivers health and social care in Shropshire. We hope to replicate this team-based approach to patient care in the community, providing proactive case management to patients over 65 close to general practice, targeted particularly at those whose needs are the greatest. We also want to ensure that our community services are more responsive when a patient deteriorates and can deliver more care closer to people’s homes. If you don’t think providers can work together or that a team-based approach to patient care can really make a difference, go and find that small room, in a small district general hospital, in Shrewsbury. It does exist and it’s working right now. Find out more about how Shropshire’s Frailty Unit are supporting patients in this video. 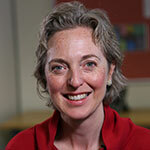 Dr Finola Lynch is a Shropshire GP and the Clinical Vice Chair of Shropshire CCG. She leads on frailty and Shropshire’s transformation programme, Shropshire Care Closer to Home. It would be really good to understand more about how these impacts on activity were measured and I wondered if you could put me in touch with the most appropriate person to discuss this with? As a nurse based on a community hospital ward Frailty is the major part of our work – we know home is a better solution than admission- we now need to work more smartly with both patients, families & partners to get these people home- maximise their independence & proactively provide services to prevent admission to our overwhelmed acute services. It all starts with Open Frank conversations. I look forward to seeing how Care Closer to Home will work in Shropshire. You’re absolutely right. Please contact me if you would like to start a conversation about that. Be involved and help us shape future care for our patients and our workforce. The voices of those who work in these services and know these patients is vital if we’re going to make this work for everyone involved.